Abaco, Bahamas Snorkling & Scuba Diving information. Your Underwater Guide. 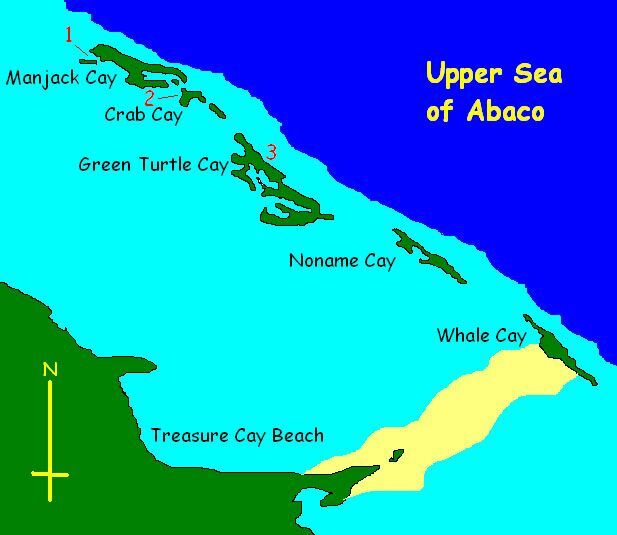 It's a listing of Dive Shops and location of reefs and ship wrecks in the Abaco Cays. Recently I did a google search on Top Dive sites in the world. I even hit on a top 100 list but Abaco was not to be found. Only two mentioned in the were in the Bahamas, the heavily traveled tourist areas of Nassau and Freeport, Grand Bahama. All the other usual places were listed of course, those with exotic names in the Indian, Pacific Oceans, and of course the Great Barrier Reef. Then there are listed those Caribbean hot spots, Grand Cayman, Belize, Bonaire etc. I was not disappointed that Abaco wasn't mentioned, despite the fact that Abacos' barrier reef is the 3rd largest in the world. The tendency is for folks to look afar. Abaco is relatively close, yet still a bit difficult to get to. For whatever reason, Abaco remains, for the most part, a secret dive location of beautiful reefs and much loved by those who have visited here. 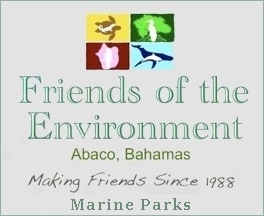 I personally know folks who return every year from as far away as Germany to dive the reefs off the north cays of Abacos with Brendal Stevens of Green Turtle. In the Abacos, there are reefs at any depth from 10 feet to over 200. Reefs for the novice and experts alike. There are underwater parks, ship wreck to explore new and ancient alike, and for the experienced diver there are the blue holes of Abaco. But it is the ocean and sea life that brings the folks back. Each island community plus the mainland towns of Treasure Cay and Marsh Harbour, has a dive shop. Listing below. Many of the Dive shops on the Cays will pick you up if staying elsewhere on the cay, be it a rental home or resort's dock. If you plan to go it alone, be sure to make use of the charts found in Steve Dodge's Cruising Guide to the Abacos. He has a whole section devoted to diving. My scuba familiarity is with primarily the reefs off Manjack having been a patron of Brendal over the years. As far as snorkeling goes, we been all over the place especially the areas providing the advantage of "mooring balls" making for convenient tie up in your rental boat and lessening reef damage with your anchor. Of those four come to mind. The beginners "Mermaid Reef" in the Sea of Abaco off Marsh Harbours "Eastern Shore" accessible by boat or rental car or taxi from town. It can get crowded at times but is a worth while stop especially for the novice snorkeler. The other three are all Govt. protected areas and accessible only by boat and with a nautical chart or local knowledge. They are, again, the reefs on the ocean side of Manjack Cay, Fowl Fowl Cay Reef Preserve between Man-O-War Cay & Scotland Cay and finally Sandy Cay Reef which you'll find enroute to Little Harbour. Oh, regarding the clever graphic atop the page. It is what it is, just that, a cleaver graphic. It is not intended to indicate an over abundance of sharks in the Abacos.  Below is a brief summery lifted from the abandoned go-abaco.com website. Although they have not been updated for years, the information below can still be useful. Again Steve Dodges book should be cross-referenced. Green Turtle Cay: Beach access diving and snorkeling from Green Turtle's eastern beaches, especially on the northern end of the cay, is exceptional. While the barrier reef should be accessed by small boat, the inner reef system offers enough underwater scenery to keep the novice as well as experienced snorkeler occupied for weeks. Right off the beach on the northern end of the cay, the inner reef is as close as 1 foot below the surface at low tide, and The Abacos' tides rarely vary by more than 3.5 feet. Great Guana Cay: Guana offers miles of spectacular near-shore reefs and dive spots as well as almost deserted stretches of dune-lined beaches. Some of the most spectacular diving to be found in The Abacos is easily discovered on Guana's northernmost beaches. Shore diving is as easy as it comes, and the rainbow-streaked rewards for novices as well as experienced snorkelers and divers makes this a "must see" site. Fowl Cay Government Preserve (North of Man-O-War Cay) Set aside by the Bahamian government as a national Land and Sea Park, this (approximately) 3 square mile reserve is conveniently reached from most central Abacos cays and settlements. While the reefs and three 25' to 40' dive spots in untouched water are truly spectacular, if a "rage" is in the forecast (strong winds and subsequent rough sea conditions), the waters in this area can be rough. With a variety of tunnels and towers to explore, the sea life is abundant -- -almost as if it knows it is protected. Johnny's Cay: (between Elbow and Man-O-War Cays) This dive spot is great for snorkeling on the outer reef or just offshore of Johnny's. Although local knowledge is always helpful when you're exploring new dive or snorkeling sites, common sense can guide experienced snorkelers to a huge variety of incredible sites in this relatively undiscovered undersea gallery. The scattered remains of an old ship can be found in a little more than 30' of water. With cannons exposed and well preserved, The Adirondack is home to rainbows of fish and a huge variety of coral formations. Sandy Cay Government Preserve Popular spot providing mooring ball. tie ups for small boats. Exposed to ocean surge in rough weather. Ten to 20 feet of water. Large stand of elkhorn coral. Hole in the Wall (southernmost Great Abaco Island- Accessable by four wheel drive veichle only with rough road). The reefs off Hole in the Wall are must shoot, "Kodak Moments" offering a variety of fascinating sights including a huge coral head at 50 feet you can actually swim through. 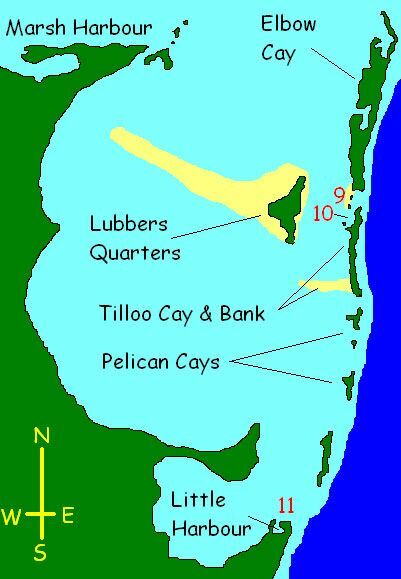 Location of Reefs & Wrecks along with Dive Shop Listing. From Sandy Estabrook's Guide to the Abacos, Bahamas. The Dodge Guide lists a number of dive/snorkel sites and is referred to through out Many of his recommended sites are good only when the wind and waves cooperate. What do you do when you have a bunch of kids who want to go snorkeling, and it's blowing like stink? Capt. Bob Knaus has boatloads of Boy Scouts aboard S/V PELLUCID who expect to get in the water every single day for the week they are aboard. So, he has figured out some spots that will let the kids get wet no matter what the weather. 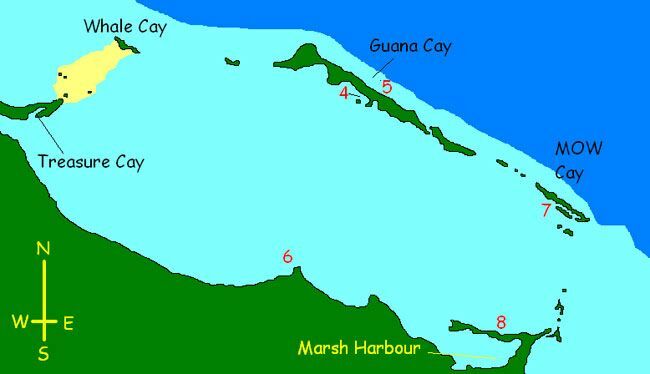 These spots are between Manjack Cay and Little Harbour, listed from north to south. Each one has brief directions, what you can expect to see, and notes regarding wind direction and anchorage. Enjoy! Directions: You are heading for the beach between the cay and Manjack Rocks. Do not cross between the rocks and the cay unless you are in a dinghy. Either follow the Dodge directions around into the bay on the north side, or anchor as shown off Manjack Beach and dinghy or hike the beach. What to see: Swim with the stingrays! All you really need to do is wade in the water. The local dive operators have been feeding the rays here for many years. They are quite friendly, and will come right up to your legs. Just don't step on them. Notes: North bay is rolly under most conditions but fine for seeing the rays almost anytime. Bay off Manjack Beach is well protected from NW through E to S.
Directions: Go to the Dodge Guide wreck symbols along the north shore of Crab Cay. What to see: Lots of small fish in the sunken barges and equipment, and along the rocky edge of the cay. Notes: Protected in winds from N through E through S.
Directions: This is a beach snorkel. From the Green Turtle Club in White Sound, follow the signs to the Ocean Beach. Or from New Plymouth, take the sand road that branches off the main one north of Bita Bay. Best entry is at the north end of the beach. What to see: A shallow inshore reef ranging from 50 to 100 yards offshore for almost a mile, with an assortment of colorful fish, sea fans, and some coral formations. Notes: Protected by the outer reef which breaks the worst of the sea surge. Especially good when a cold front brings the wind around to the south or west. Will be murky with strong N to E winds. Directions: Just around the corner from the Settlement Harbour in the middle of the island. Or take the road to the Dive Guana shop. A rocky groin juts across from the Dive Guana dock, there are various pieces of debris on the bottom throughout the mooring field, and a small reef is located about 150 yards north of the mooring field. What to see: A Pacific species, the lionfish, lives in the rocky groin. Pretty, but don't touch! Sharks, rays, and jackfish cruise the bay while the small reef has the usual assortment of small fish. Notes: Protected from N through E to almost S. A popular spot for a swim, but do watch the boat traffic as it can be pretty heavy. Best to keep the kids near the boat. Directions: Follow the signs from the settlement to Nippers. Try not to get stuck at the bar. Enter the water just to the left of the rocks immediately below the bar. The reef is about 75 yards offshore, and parallels the beach for about 200 yards. What to see: The outside edge of the reef drops from the surface to 20 feet or more. The shallow edge has many small colorful fish while the larger ones hang out in the deeper water. It is not unusual to see several barracuda here. Notes: A good spot in a southerly blow, the high beach dune protects from SSE through NW. Occasionally a heavy swell will make entry difficult. Do not swim over the reef, it is shallow and often breaks. Swim around either end. Directions: Go to the west side of Water Cay, staying well off the point to avoid the shallow rocky bar. The wrecks are prominent, in about 9 feet of water. There is also some debris from the old conch farm. What to see: Assortment of small fish hang out at the wrecks. The surrounding area is said to be a good lobster spot. Notes: Protected from E through S to W.
Directions: Proceed to the anchorage shown near Old Scopley's Rock off the north entrance to the harbor, or anywhere to the north off the chain of small rocks and the cove to the north as your depth permits. What to see: Various pieces of debris dot the bottom, and the chain of rocks provides bottom cover. All of these attract small fish. The northernmost rock is used as a conch cleaning station by the locals. You can have your pick of souvenir shells from the bottom, already cleaned out by the critters. Sniff the shells to make sure you don't have a stinker. Notes: Good from N through SE, although some swell will work around when it is strong from the NE. The beach at the narrows on the cay is shallow and protected, a great spot for kids who are just learning how to snorkel. Directions: A popular, well-marked spot about a mile SE of the main harbor entrance. You can't miss the floating sign and anchor buoys. The reef is about 50 feet inshore of the buoys. Or, from the Jib Room turn right on the paved road and walk 200 yards to the rocky beach on your left. What to see: LOTS of fish, all swimming right up to you. The fish are used to being fed Cheez-Whiz, crackers, Cheerios, etc. If you take cereal, put it in a zip-lock and not your pockets, unless you like fish swimming in your shorts. Notes: When it's windy, this reef is quite calm from SE through SW. The buoys are for small boats only. If you anchor, be aware that the bottom here is thin, rocky, and very poor holding. Directions: Follow waypoints between Lubber's Quarters and Elbow Cay. Most small powerboats anchor off the sandspit, while larger boats anchor north of Baker's Rock and dinghy in. What to see: There are two deep holes scoured out by the tide just behind the gaps in the rocks that protect the beach from the waves coming in Tilloo Cut. Depending on the tide, these may contain sharks, bonefish, and many small fish. As the tide rises, the sharks and bonefish leave the holes to feed on the sand flats. There is some current in the tide pools but it is a short swim to knee-deep water. Notes: The sand flats protect the tidal pools from almost any wind direction. Plus the beach is great. This is the spot to go when it's too darn windy to go anywhere else. Directions: Follow waypoints to area between Lubber's Quarters and Tilloo Cay. The Dodge Guide shows 4 snorkeling spots within a quarter mile of the prominent castle. In addition, there are scattered coral heads within 50 feet of the shoreline all the way south to Tilloo Bank. What to see: Small fish use the coral heads for shelter. Finding the small heads south of the castle is fun and can fritter away most of a day. Notes: Generally protected from NE through SE. There is a bit of current near the Fish Hotel but not much elsewhere. Easy anchorage anywhere. Directions: Follow waypoints to enter Little Harbour. Go ashore at the dock, and follow the sand road behind the foundry to the beach. Enter near the far end of the beach, the reef stretches out about 100 yards from the rock point at the harbor entrance. What to see: Elkhorn and other corals that thrive in the surge, along with small reef fish. Spotted eagle rays can often be seen. Notes: Good from E through S through W. On days when a strong swell is coming through the cut, entry may be difficult. Do not swim over the top of the reef as it often breaks. Little Harbour has a 3.5' depth at low water which may limit the times you can enter and leave. It is possible to anchor off the beach and swim to the reef, provided the swell is not too bad. It's best to enter the harbor and pick up a mooring. These are free during the day, $15 if you stay the night.